Due to the ever-increasing scope of medical science, the field of biomedical engineering continues to grow, change and develop. In fact, the Bureau of Labor Statistics (BLS) estimates that the field of biomedical engineering will grow by 72.02 percent between 2008 and 2018, making it the fastest growing field in the United States. If you want to pursue a very stable medical career, learn more about what it takes to become a biomedical engineer. Biomedical engineers are the individuals who come up with new and exciting medical technology that helps increase and improve life, especially in individuals suffering from major injury or illness. For instance, biomedical engineers help research and develop artificial organs, prostheses and medical information systems as well as major medical equipment like MRI machines or equipment used to control bodily functions. Most current biomedical engineers have a background in electrical or mechanical engineering, but because the field is growing so quickly, more colleges and universities are offering undergraduate programs specifically focused on biomedical engineering. To enter the biomedical engineering field, you must have at least a bachelor's degree, preferably in biomedical engineering, electrical or mechanical engineering. While many entry-level engineering jobs only require a bachelor's degree, according to College-Grad.com, entry level positions within biomedical engineering often require a master's degree. This is because many positions require a specialty that is obtained through additional education and experience. Specialties within biomedical engineering include biomaterials, biomechanics, medical imaging, rehabilitation engineering and orthopedic engineering, just to name a few. All states require engineers to become licensed. At a minimum, licensure requires graduation from a four-year university program and at least four years relevant work experience. Recent college grads can begin the licensing process by taking the first segment of the licensing exam. After passing this portion they're considered Engineers in Training (EITs) or Engineering Interns (EIs). After completing four or more years of work within the field, they can then sit for the second portion of the exam to become fully licensed Professional Engineers (PEs). Biomedical engineers are essentially the glue that holds medicine and technology together. They work in teams with other researchers and scientists to design, develop and implement new medical technology that allows medicine to continue advancing. 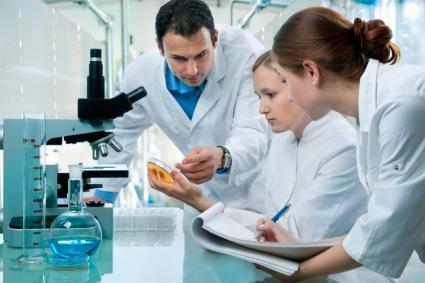 Depending on the subspecialty, a biomedical engineer may work with chemists in the research of drug delivery, or may work with orthopedists to design and develop new mechanisms for enhancing mobility in a disabled or aging population. The real key here is that because the field is growing so quickly, the sky is the limit for possible career applications. While most biomedical engineers work for pharmaceutical companies, there may be many more opportunities opening up in the future. Philip Leduc, an associate professor at Carnegie Mellon University told US News and World Report that he's seeing positions opening up in finance, strategic consulting and law. The BLS notes that the median salary for biomedical engineers is roughly $77,000 per year, while the top 10 percent makes more than $120,000 annually. To command a higher salary, you need to gain experience within the field and may need to be willing to take on leadership roles in research or be willing to supervise a team. Even if you're not currently ready to start your career, keeping an eye on the job boards will help you get a feel for the companies hiring and the types of positions that are frequently available. This can even help you narrow down in which area you would be most interested in specializing.